Deborah Sokolove is the director of the Henry Luce III Center for the Arts and Religion at Wesley Theological Seminary, where she is also professor of art and worship. She received her B.F.A. from California State University at Los Angeles; the M.T.S. from Wesley; and the Ph.D. in Liturgical Studies from Drew University. Her book, Sanctifying Art: Inviting Conversation Between Artists, Theologians, and the Church, was published in 2013. Last summer, while the world was still reeling from the attacks at the offices of Charlie Hebdo and a Jewish supermarket in France earlier in the year, as well as the many other acts of violence perpetrated in the name of Islam, while the Middle East was in turmoil due to the rise of the Islamic State in Syria, and while calls for severely restricting the immigration of Muslims to the United States were already being heard, the stunning power of photographs and video installations by Iranian-born artist Shirin Neshat filled the quiet galleries of the Hirschhorn Museum in Washington, D.C. Walking through the aptly named exhibition was like turning towards a past that is both familiar and strange, looking through the eyes of someone with Western sensibilities and Middle Eastern memories. Neshat invites us to face a long history of power, culture, and faith through the faces, hands, and feet of individuals who seem to be, simultaneously, rigorously themselves and representatives of their time and place. Shirin Neshat was born in Qazvin, Iran in 1957. At the age of 17, she came to the U.S. to study, intending to return when she completed her education. In 1978, history interrupted her plans with the Iranian Revolution, and she did not return to her country of birth until 1990. For the following six years, she traveled there regularly, but for the past two decades, as her art has become increasingly well known, she has had serious doubts about her safety under the current regime and engages with events there only at a distance. This retrospective of her work from 1993 to the present is the record of her sense of exile, her love and longing for her homeland, as well as her critique of its political and social situation. The scene in the photograph reappears in the video, which is filled with evocative scenes of Munis watching as men and women march through the streets in separate groups, finally merging in the town square as military vehicles bear down on them. Unable to join either the revolutionaries or to remain under the authority of her brother, Munis steps off the roof of her house, her skirt billowing around her as she flies downward to join the man who is a symbol of both freedom and death. In both the still and the moving image, the camera hovers above them like the omniscient eye of God. These two works set up a rhythm of large, intense, nearly monochrome photographs—most of them altered with writing in black or sometimes red ink—punctuated by lyrical, complex, nearly wordless video installations. Both the videos and the photographs question what it means to be a human being in a world that mandates very particular roles according to gender, age, and class. While there is no clear narrative line, the tension between the artist’s nostalgia for a half-remembered past and her yearning for freedom from all forms of oppression, both overt and subtle, is palpable in both moving and still images. The installation consists of forty-five 40” x 30” gelatin silver portraits of what Neshat terms “the masses,” ranked in three rows along one long wall. Although the men and women are all in similar poses and wear similar, dark clothing, each one is an individual, showing varying expressions that range from fear to anxiety to defiance to resignation. Their faces are covered with fine, almost invisible writing, like thin veils that cannot protect them from whatever kings and tyrants might send their way. 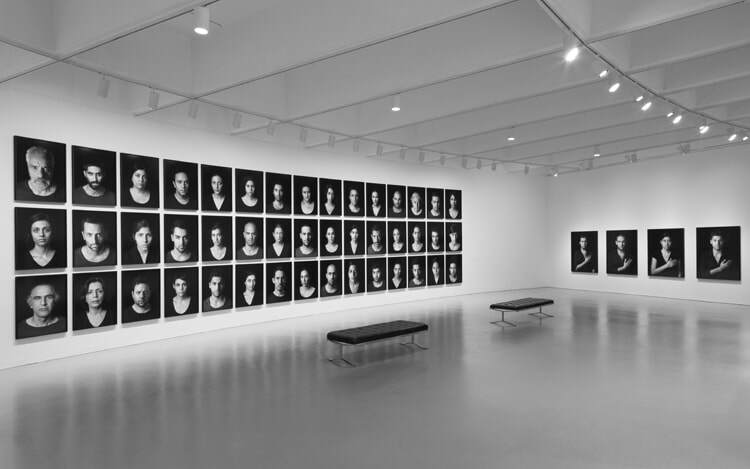 Installation view of Shirin Neshat: Facing History at the Hirshhorn Museum and Sculpture Garden, 2015. Works from “The Book of Kings” series, 2012. 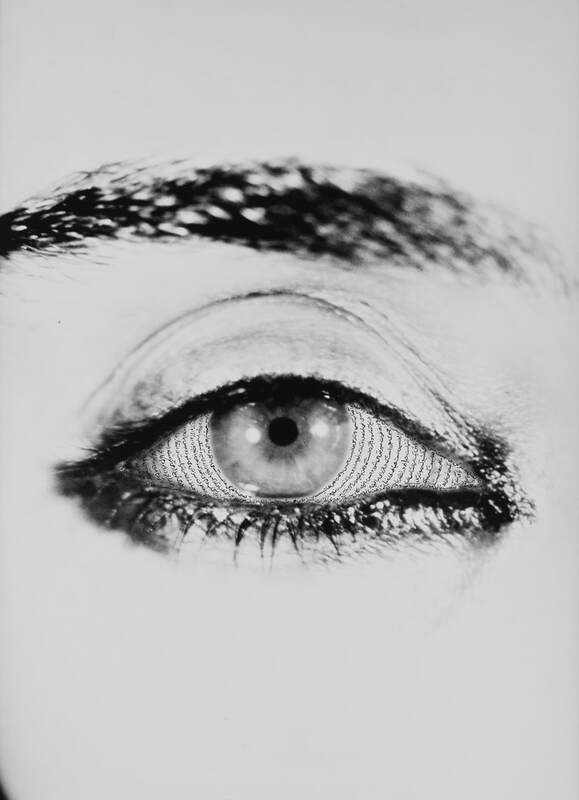 Artwork © Shirin Neshat. Courtesy Hirshhorn Museum and Sculpture Garden, Smithsonian Institution, Washington, D.C.
Two other walls contain portraits of eight youthful “patriots,” hands positioned over their hearts, their faces veiled with words written in columns to look like the traditional formatting of the Shahnameh. Again, there are both men and women, all dressed alike in dark, v-neck shirts, all looking resolutely outward. These 60” x 45” gelatin silver photographs are larger than those of the masses, so large that visitors can stare almost directly into the life-sized faces. It is not clear whether they will protect the masses or become tyrants in their turn, only that they love their country enough to die for it. The fourth wall is dominated by 99” x 49.5” full-body portraits of three men whom Neshat describes as the villains, “political or religious figures who control and dominate the destiny of others.”5 The central figure is seated squarely in front of the camera, his still-powerful fingers outstretched firmly on his knees. He is the elder, his white, bristling mustache and level gaze daring anyone to contradict him. Flanking him on either side, and slightly turned towards him yet also gazing directly at the camera, are two younger men, thinner, sinewy, middle-aged but still at the height of their physical power. 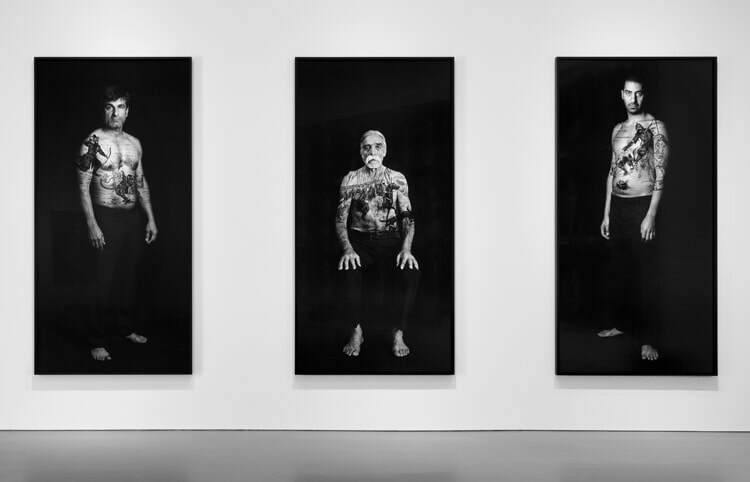 All three are dressed simply in dark trousers that disappear seamlessly into the darkness behind them, exposing their faces, arms, torsos, and feet to the tattoo-like traces of Neshat’s pen. Here, instead of the customary words, Neshat has copied illustrations from an early twentieth-century lithographic version of the Shahnameh, in which the markings in red crayon made by an earlier owner suggest the blood and pain of battle. Covered with the symbols of ancient royalty, these three succeed only in looking like criminals or gangsters. Like Turbulent, Rapture, and Fervor, the other two-channel video installations in the exhibition, Soliloquy consists of two sequences projected onto huge screens on opposite sides of a large, dark room, so that it is difficult if not impossible to see both screens at once. In one, a woman dressed in a black robe and headscarf stands at the barred window of a traditional, Middle Eastern house, gazing impassively directly at the camera. In the other, the same woman stands at the plate glass window of a modern house, facing herself across the darkness. As the paired videos progress, in one the woman is seen walking and sometimes running in an airport or outside steel-and-glass buildings; while in the other, she traverses ancient streets and courtyards or barren desert dunes. She is almost always solitary, except that, towards the end, she is seen on one screen standing in a chapel where white-garbed nuns and monks gaze questioningly at her as they process in front of a cross; while on the other, she is in a long, narrow, decaying building, standing alone in the center of a large circle of black-garbed women. These sequences raise questions about the relationship of Islam and Christianity, of modernity and tradition, in ways that neither demonize nor idealize either. Since Neshat is both the woman that we see on screen, and the writer/director behind the scenes of the film, we are left to wonder as much about her faith as about her geographic yearnings. In all of her work, whether still or moving, Neshat works like a director, engaging many others as she seeks to create a mood, a feeling, the sense of mystery hovering beneath the surface of the everyday. The images are clearly staged, with well-lighted subjects, generally in dark clothing, posed against even darker backgrounds. Most of the still photographs are printed very, very large, so that every pore, every hair, every muscle is visible. While several different photographers contributed to the Women of Allah series, all of the photos in The Book of Kings and Our House is on Fire are credited to Larry Barns. The video installations were originally shot on film, and transferred to video for this exhibition. 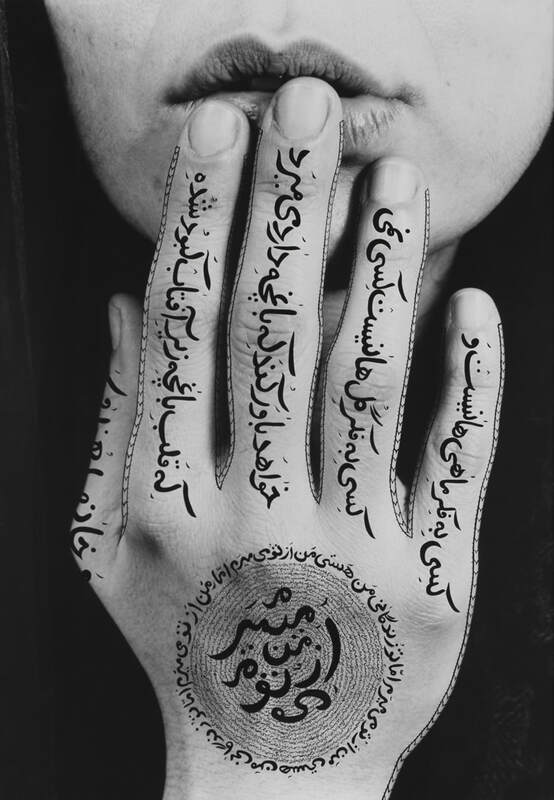 Back in her studio, Neshat adds the writing that completes each image, choosing the words of contemporary women poets and storytellers while visually evoking the calligraphic tradition usually reserved for the words of the Qur’an. The effect is like being in a state of hyper-awareness, with subject and viewer held together in an eternal now, a moment when time stands still even when the images move. Time resumes its normal pace in the small rooms and passageways between the large galleries containing photographs and video installations. There, monitors show archival footage of riots, coups, and speeches by the Shah, the prime minister, revolutionaries, imams, and other important figures in the recent history of Iran; on the walls, reproductions of newspaper clippings about those events are posted along with explanatory texts; and copies of books, sketches, and other objects from the artist’s personal collection are displayed in cases along with details of Neshat’s life. It was as though viewers are invited backstage, or into the artist’s studio, to visit the sources of her imagination and to take a deep breath before plunging back into her powerful, enigmatic vision. As an Iranian woman artist living in the U.S., Shirin Neshat has much to tell us about identity, about politics, about art, and about faith. The history that she asks us to face is not just the history in which Persia became Iran, where the Shah was deposed, and where Ayatollahs now reign. It is not just her personal history, in which a young woman left home and has lived in exile for nearly forty years. It is the story of each one of us and all of us together, all of us living in exile from a half-remembered past and facing into an uncertain, fragile future. What Neshat’s images and films tell us is that history is not just what is written in books, but what is written on our hands and feet and faces and hearts. We are all facing and making history together. Shirin Neshat, “Munis,” in Shirin Neshat: Facing History, Melissa Chiu and Melissa Ho, eds. (Washington DC: Hirshhorn Museum and Sculpture Garden in association with Smithsonian Books, 2015), 55. 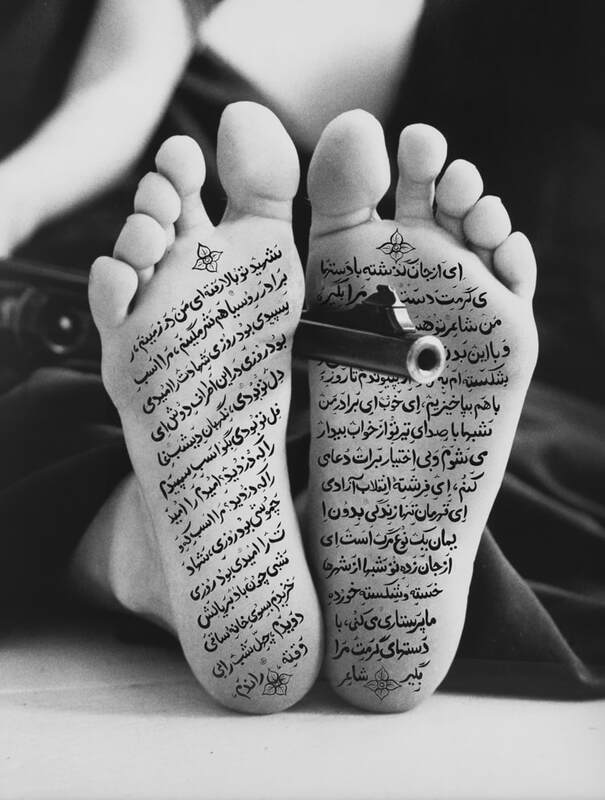 Neshat, “The Book of Kings,” 164. Neshat, “Our House is on Fire,” 185.